In the highly competitive industry of health and medicine, finding a niche career can be difficult. What medical fields will be most in demand? What will pay well? What will allow you to best achieve your goals regarding caring for others? What will be most rewarding? If these are questions you are asking yourself, consider a career in respiratory therapy. In the state of California, respiratory therapists are highly in demand. Everything from California’s health and age demographics to environmental quality issues factor in to the growing necessity for individuals certified to provide supportive and essential care to those with respiratory problems. As a respiratory therapist, the primary duties this career entails involve evaluating, treating and looking after patients with difficulties breathing or those experiencing complications of pulmonary diseases. Training and work is conducted under the authority of a physician. However, respiratory therapists have the authority to conduct all respiratory analysis, treatment or supportive measures taken. Respiratory therapists work with patients of all ages, though most frequently work with the elderly and those on life support. Therapists work together with physicians in the development of care plans for patients. For that reason, this job is ideal for those who appreciate a work environment with a team making a collaborative effort towards patient welfare. This job involves designing care regimens for infants with under-developed or impaired lungs, those with heart disease, patients who suffer from chronic asthma, emphysema or individuals who have endured a stroke. Working with patients to create regimens provides a give and take with the ‘human side’ of medicine. Therapists must understand the concerns and needs of their patients, thus translating it to the potentially life-saving care regimens. Respiratory therapist may often need to go on fact-finding missions. It is necessary to do some amount of medical detective work and research in order to meet a patients’ needs. To better assist patients, respiratory therapists collect family history information, conduct diagnostic tests including pH level, lung capacity, electrocardiograms or other forms of triage exams. Administering physical therapy along with medicines or oxygen/oxygen mixtures is another primary duty. Respiratory therapists are front line in supportive care for those in need of assistance during chest physiotherapy, lung therapy or asthma therapy. Respiratory therapists must keep a sharp eye on patient needs and their ability to breathe comfortably and well. This entails monitoring and testing equipment to ensure correct function, being ready for a respiratory emergency and working to avoid additional complications in patients whose respiratory function is already compromised. Being a respiratory therapist also allows for the unique opportunity to provide in-home care to patients requiring ongoing monitoring, physical therapy and supportive care. These types of patients range from those with oxygen tanks and ventilators, to those with nebulizers or other in-home respiratory equipment. Working in partnership with patients, families and health providers permits respiratory therapists to close the gap between the average person and the medical care industry. This career is especially rewarding as it creates a warm dynamic between patients and providers throughout recovery, rehabilitation or ease of lifestyle for those who are terminally ill. Along with in-home care, routine check-ins on patients and patient equipment is often necessary. Insuring that a patient environment meets standards of care is among the main responsibilities a respiratory therapist fulfills. This involves inspecting medication supply, emergency preparedness plans and continuous assessment of patient needs. Why Become a Respiratory Therapist in California? Of all the essential health needs, respiratory therapy is a pivotal part of wellness. Being a respiratory therapist makes for a great variety in work responsibilities and duties. It also allows therapists the opportunity to work with a wide array of people. Respiratory problems can strike at any age. Providing care to those in need of ongoing attention is both rewarding and interesting, making for a versatile work experience. Having worked as a respiratory therapist will also open up many doors in the world of related fields providing critical medical care. Triage-related medical career including emergency medicine are a pay grade higher as well as always in demand. The lowest educational requirement to train as a respiratory therapist is an associate’s degree or, more ideally, a bachelor’s degree. Having a master’s degree is greatly helpful towards certification in this or other related fields, especially if master’s studies focused on any aspects of physiological, pharmacological, scientific or otherwise medical study. Ideal classes to take involve mathematics, health and human services or human anatomy. Training programs geared towards orienting individuals as they move towards certification as a respiratory therapist often takes place in physicians’ offices or hospitals. Having plenty of hands on experience and clinical study is a key in gaining competence in this field. Not all programs offer such opportunities so when choosing a training program, dig deeper and look for programs providing a high degree of student involvement. Also seek out programs detailing safety protocol regarding the duties of a respiratory therapist. Other related medical safety courses may be warranted and considered beneficial on a resume when applying for respiratory therapy related jobs. Certification requirements to become a respiratory therapist in California vary based on the exact criteria from employer to employer. Clinical hours will also vary based on the training methods of the exact program you enroll in. If you need to obtain an associate’s degree, most can be finalized within 18 months to two years. A bachelor’s degree, depending on students’ pace, can be completed within 3 to 4 years. The Licensing Division of the California Board of Respiratory Therapists advises an advanced degree is beneficial in the pursuit of a more lucrative career in the field with more opportunities for advancement. According to the Respiratory Board of California, exact certification required to become a respiratory therapist is either a Registered Respiratory Therapist (RRT) certification granted by the National Board of Respiratory Care (NBRC) or a Certified Respiratory Therapist (CRT) license. Degrees, whether associate’s, bachelor’s or masters, must be accredited by the Commission on Accreditation of Allied Health Education Programs (CAAHEP) or the Commission on Accreditation for Respiratory Care (CoARC). Obtaining certification as a Registered Respiratory Therapist (RTT) or a Certified Respiratory Therapist (CRT) are decided by passing an exam. This exam is conducted by the National Board of Respiratory Care (NBRC). Having up to date CRT and RRT certification provided by the National Board of Respiratory Care (NBRC) is essential when supplying proof to the California State Board. In California, respiratory therapists must meet specific requirements including a successfully concluded degree program with accreditation backing by CAAHEP or CoARC. Alternately, professional on the job experience within the field as proof of competence may waive this certification obligation. The Licensing Board of California may overlook certain educational or certification requirements in the cases of those with existing licenses in other states or positive ratings and recommendations from those who worked with them or received care from them. Passage of state-mandated/approved courses in law and medical/professional ethics is also required. Often, these course are made available online via distance campus. However these courses are completed, they are a pivotal requirement for respiratory therapy licensing. The final step in applying for licensure as a respiratory therapist in California is to complete a formal application including any supporting documents, professional background information and a check in the amount of $200. This amount covers the application fee. Applicants can expect fingerprinting and background checking. Background checking is conducted as a way to confirm or deny any criminal record as well as confirm one’s educational background, grades, results and any other feedback from previous employers. What Can I Expect in this Career? The working environment and conditions for respiratory therapists can range greatly depending on the specific care outlet. Most respiratory therapy jobs take place within a hospital setting or within departments specializing in respiratory health or triage. These departments can include surgery, anesthesiology and pulmonary care. Other respiratory therapy jobs may take place within care homes; private medical practices and health agencies, home care environments and nursing homes. The pace of work can range from leisurely to swift. The average work schedule of a respiratory therapist is between 35-40 hours per week. It is important for respiratory therapists to feel at home in hurry-up-and-wait or high stress environment. Working with patients in potentially life or death situations requires physical stamina and dedication. It also requires a good energy level and the flexibility to work as needed. Such jobs often require workers to be on call at all hours. Whether needed at once at a nursing or care home or required to make hospital rounds, the job is considered physically demanding. Much walking or standing may be required during necessary tasks and patient evaluations. It is highly important for respiratory therapists to carefully study safety precautions when working around potentially volatile gases or other breathing devices and equipment. This job is ideal for someone who can focus on acute detail during stressful or lengthy shifts. Within this field, one may be exposed to infections or other potentially dangerous bio or chemical agents. For that reason, care workers within this field must closely follow all safety guidelines for their own well being as well as the well being of those around them and those for whom they care. 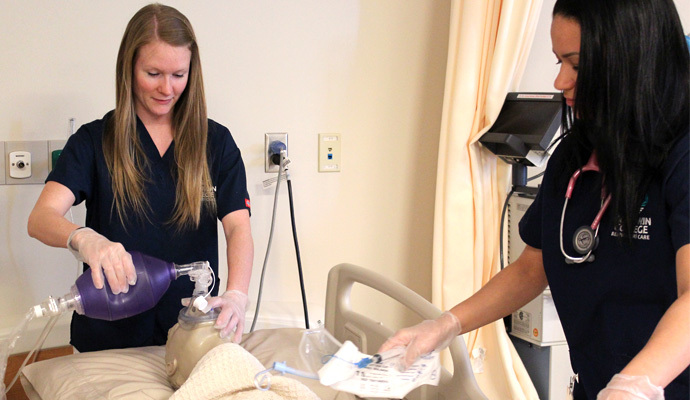 Respiratory therapy is a career path on the rise as far as demand and pay. Its career growth rate is quicker than the average for all occupations, ‘an expected 21% from 2008 to 2018’ (Bureau of Labor Statistics, 2015). California especially is in need of more certified respiratory therapy workers. There is a great opening for such caregivers in the recent years. There is also a growing demand, as the California population ages, for those willing to work such jobs. The aging of the California population predisposes many to respiratory-related conditions requiring close monitoring, including preventative medical care, case management, physical therapy and rehabilitation and monitoring. Respiratory therapists bridge the gab between emergency medicine and preventative medicine in the cases of those with chronic breathing conditions or pneumonia. These workers play a crucial role in delivering emergency services, diagnostic services and are front line to provide life-saving medical intervention. Respiratory therapists also have the role of working closely with patients to detect problems before they arise (i.e. ultrasound, EKG, heart disease early detection, breathing/monitoring equipment). With California’s substantial rise in instances of cardiopulmonary related problems, the need for respiratory therapists is projected to continue to rise. Expected salaries for respiratory therapists in California ranges between $53,000 and $58,000 per year. The mean annual salary is around $55,000. Slightly less than one third of employers offer sign-on bonuses to respiratory therapists. These bonuses can be up to $5,000. California’s most popular and profitable hub cities for respiratory therapists include Los Angeles, Oakland, Riverside, San Diego and Santa Barbara. This job is an ideal step towards receiving a variety of current and long-term personal and financial benefits. The most commonly offered benefits for those working in this field include medical and dental benefits, vision assessments and care, sick leave, maternity leave and vacation leave, life insurance and pension planning services. Even entry-level pay for respiratory therapists provides a substantial annual income with which one can consider many more options. Additionally, the ability to pursue career advancement is excellent through working as a respiratory therapist. Whether it provides the opportunity to return to school for an advanced degree (bachelor’s, doctorate, Ph.d.) or other medical certification, the field opens many doors. Through gaining experience in the medical profession in such a vital area of medical care, a wealth of knowledge and experience is at a respiratory therapist’s fingertips. Personally rewarding aspects of the career including saving lives, restoring and rehabilitating those in need, providing supportive care to those with ongoing needs or chronic conditions and working in partnership with families and medical professionals. Combining technocratic medicine, equipment know-how and safety precautions with a personal touch, this career suits those able to incorporate what they have learned into first-hand assistance. Respiratory Care Board of California: Department of Consumer Affairs.